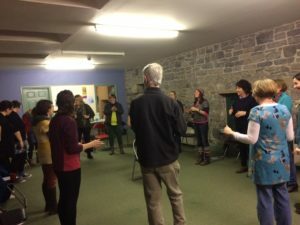 Participants of Sing Together would like to invite anyone who enjoys singing to join them in St Mary’s Hall in Carrick on Shannon where we will learn to sing easy harmony songs and rounds. We do a bit of everything – Gospel, Pop, Sacred, Folk and songs as Gaeilge. Sarah Wood from the Carrick Sing Together group says, “Singing is great for the mind and the body. It is a great way to kick off the Spring!” €10 for the day. Bring some food to share for lunch. Tea, coffee and biscuits provided. For information call Sarah on 0877620523.